In the following post intermediate students of English can learn to form wish clauses starting with I WISH or IF ONLY. In my opinion wish clauses are quite easy to master. However, if you feel it differently, there are several helpful features to change your mind. There are several interactive quizzes, an explanatory video and an infographic. If you have a blog or a website, where you would like to share the content published here, you can do so by downloading the zip file at the end of the post and uploading it to your web. 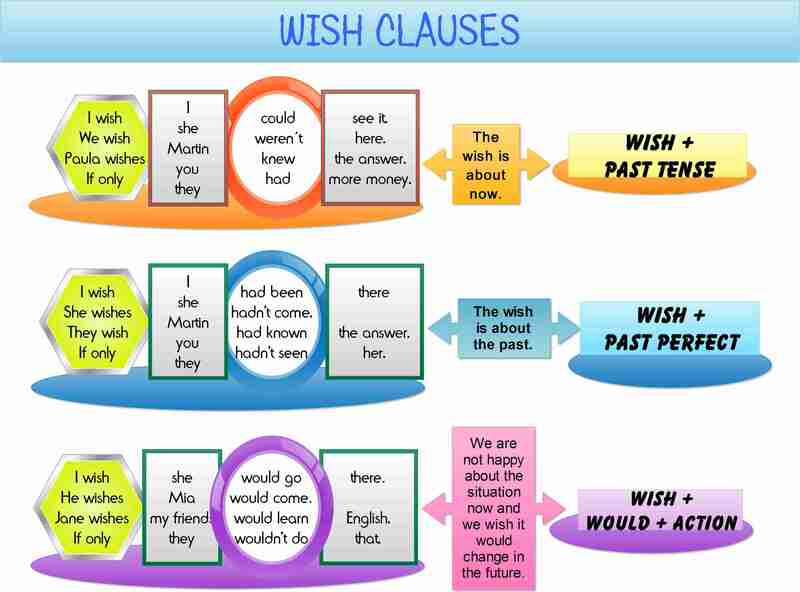 The following infographic contains the basic explanation how to form wish clauses. I did not manage to get into the infographic several pieces of information. First, if you regret something something that you did not do in the past and you use the verb could, you do not use the past perfect tense but you use the form COULD HAVE DONE something. Second, we use the from I WISH somebody WOULD do something, if we are angry and we would like someone to change their behaviour right now and keep it changed in the future too. Third, in wish clauses we can use WERE instead of WAS and it is still correct. At BBClearningEnglish.com they publish great materials for learning English. However, most often than not they publish their material as an mp3 file instead of video. That is why I have turned their wonderful Grammar Challenge on regrets into the following video. The following interactive quizzes are in HTML5 so they will play in all browsers on all mobile devices. The quizzes contain nearly 30 sentences to practise the grammar. If you pass the test you can play a short game. If you feel you have not had enough practice, you can go to British council site and try the quizzes there.